2.Please place the light under direct sunshine charging for at least 3 to 4 hours before first time use as it may run out of power during the long time transportation. Irradiate for a long time At night and shut down during the day. When people comes, the motion light will be in high light, after people go, the motion light automatically turn off. Update Design: Super bright 30 LEDs, design with solar panel and rechargeable battery. The solar lights charging time is about 8 hours, working time will last 10-12 hours. PIR Motion Sensor: Irradiate for a long time At night and shut down during the day. When people comes, the motion light will be in high light, after people go, the motion light automatically turn off. Waterproof Rating: IP44 and durable enough to last for years. ABS plastic with Corrosion-resistant, heat-resistant. Easy to Install: Solar powered, easy to install, no wiring required. Simply screw it onto the surface (Screws included) and easy to maintain with detachable solar panel and LED Lamp body to the supporting cover. 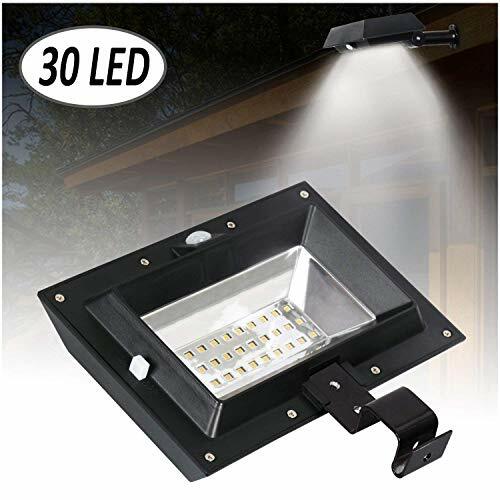 Widely Used: Great outdoor light for your garden, backyard, path, aisle, gutter, wall moun, fence, porch, patio Path, or driveway etc.